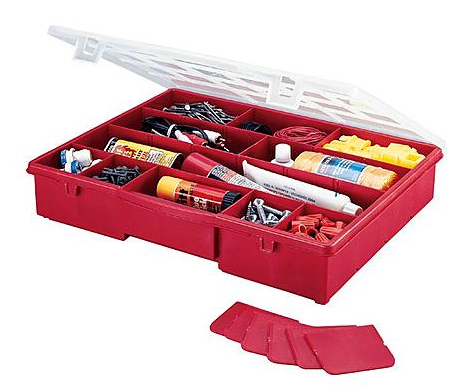 Stack-On 14-1/2" 17 Compartment Storage Box Just $4.99! Down From $15.99! You are here: Home / Great Deals / Stack-On 14-1/2″ 17 Compartment Storage Box Just $4.99! Down From $15.99! Stack-On 14-1/2″ 17 Compartment Storage Box Just $4.99! Down From $15.99! Sears has this Stack-On 14-1/2″ 17 Compartment Storage Box on sale for $4.99 (Reg. $15.99)! Multi-compartment storage box with 6 removable dividers. Clear design allows you to see the contents at a glance. Cover firmly snaps shut. Contents not included. Includes built-in carry handle.